Most diners would think twice about good Japanese food being served in a Food Republic restaurant. Girlfriend and yours truly felt pretty skeptical as well, but were eased by the snaking queue forming outside Koh Grill & Sushi Bar. As Singaporeans, our kiasu mindset immediately made an assumption that this sushi bar is definitely a glutton's favourite hunt and thus allow our love for food consume us as we joined the queue. If there is only one food item you could have, it must be their signature Shiok Maki (S$16.80) and it is called "SHIOK" for a reason - grilled unagi (eel) and soft avocado strips wrapped in a lightly roasted salmon maki, topped with melted cheese, mayonaise and an abundance of flying fish roes. 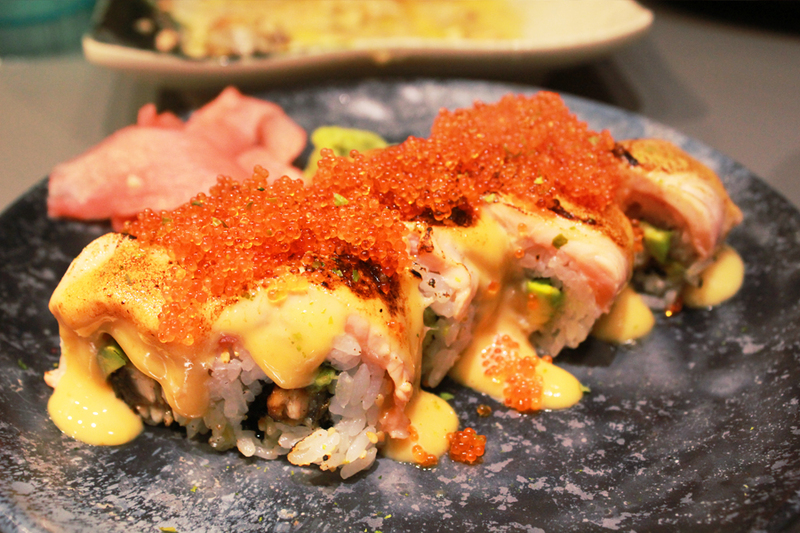 The sinful burst of flavours were incredibly amazing and has since, found a spot in my favourite maki list. 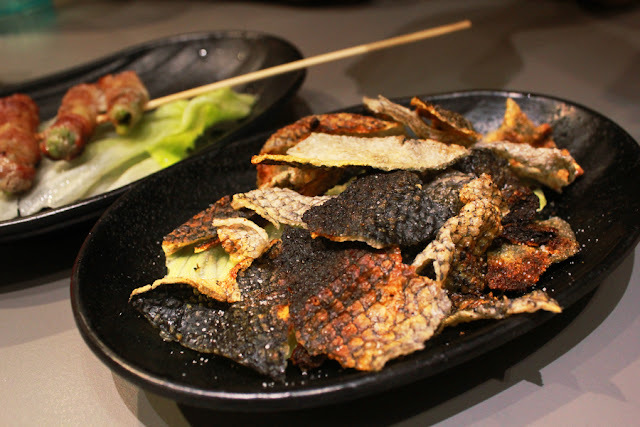 The lightly-salted Salmon Skin (S$4.00) has a delectable crisp to every single bite, which make this dish a good side kick. Come to think of it, salmon skin is a pretty awesome beer snack. 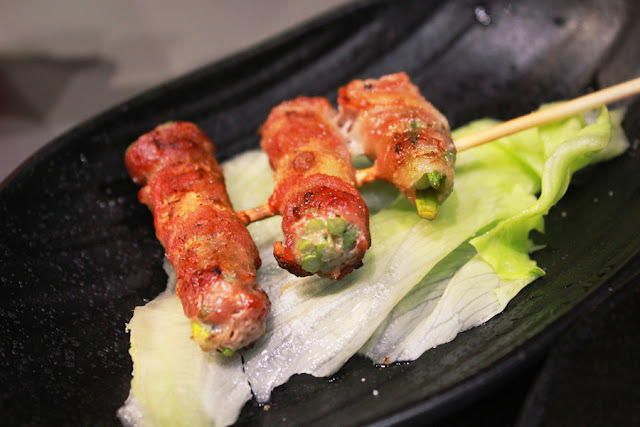 I felt cheated when the Asparagus Buta Maki (S$3.00) arrived on my table, as it was puny in comparison to the usual. However, this delightful wrap of slightly crisped bacon and juicy asparagus was a surprise to the palate. 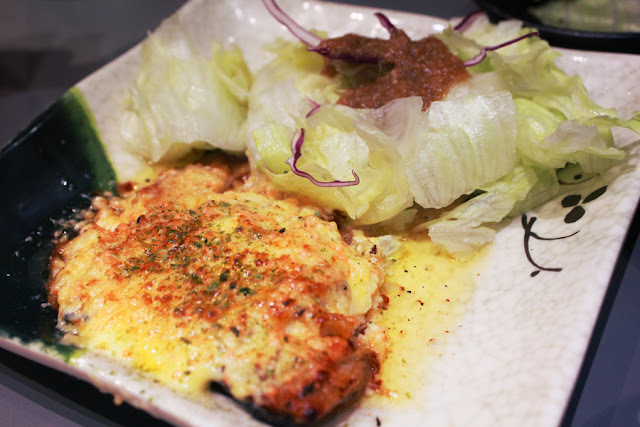 Gindara Yaki (S$16.00, additional S$2 for rice and miso soup) - cod fillet baked with cheese and flying fish roes, completed with fresh cabbage salad and garlic miso sauce. It was a tad salty for my liking but the sinful, yet addictive combination was too alluring to resist. If you are looking for good, and yet affordable Japanese cuisine, do look no furthur than Koh Grill and Sushi Bar.